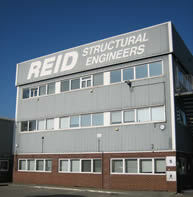 REIDsteel have been undertaking the design, fabrication and construction of steel structures since 1919. Our steel grandstands, bleachers, arenas, auditoriums, theatres, sports halls and stadiums can be found all over the World. We have built stadia for some of the UK's top sports clubs, including Aston Villa, Charlton Athletic and Portsmouth FC, as well as at race courses such as Rockingham Motor Speedway. We design, make and erect straight-forward, cost effective grandstands, which comply with the safety and viewing standards of the Taylor Report. REIDsteel is one of the few steel construction companies in the World able to do the structural design and planning of all aspects of stadiums, including canopies and roofs, accommodation, gangways, entrances and exits, tunnels, terracing and sight-screens. We will also design and supply the suspended floors for offices or function rooms with pre-cast or in-situ cast composite floors, including the staircases. We can design the Directors' boxes and TV boxes in the stands or suspended from the roofs. At REIDsteel, we use only the highest quality British Steel for all our structures including our grandstands and stadiums, which can be supplied hot dip galvanised if required. We are Registered Qualified Steelwork Contractors, which means we have been assessed on personnel, organisation, experience, knowledge, equipment, capability and commitment, and are qualified to produce all forms of steelwork. This ranges from the lightest architectural metalwork, to heavy industrial plants, aircraft hangars and high rise buildings, and, of course, grandstands and stadia. We have also developed our own patented Archspan building design. At our four acre site in Christchurch, we can design the complete structural design in our Drawing Rooms and offices, and fabricate the structures in our factory. We can arrange shipment to nearly every country in the World, as well as the construction and erection either by our own erectors or others.